Taking in highlights of the exceptional collection and exploring the rich stories of this fascinating townhouse, our daytime house tour offers a fascinating introduction to the finest Georgian townhouse in England. Enjoy a tour with your own guide when you book a visit for 10 or more people. Tour includes your own guide. 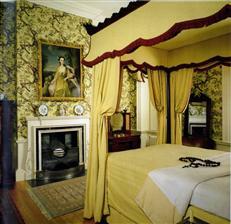 Experience the special atmosphere of Fairfax House when the museum has closed its doors to the public. This exclusive evening group tour will let you discover stories of the townhouse, the Fairfax family, and the superb Noel Terry collection of furniture, clocks, paintings and decorative arts, described by Christie’s as one of the finest private collections of the twentieth century. Our expert guides will also reveal some of the collection’s most intricate and secret drawers. Lasts approximately 1.5 hours. Minimum 10 people. Tour includes your own expert guide and a glass of wine or soft drink. For groups with a particular interest or specialism within the world of fine arts and antiques, let us organise a bespoke Connoisseurs Tour for you. Offering exclusive evening access, this ultimate private tour will be tailored to meet your group’s interests and requirements, whether horology or decorative arts, paintings or perhaps 18th-century dining. By special arrangement a curator’s tour may be arranged with the Director of the house. Lasts approximately 1.5 hours. Minimum 15 people. Tour includes a reception in the library with glass of sparkling wine and a copy of the House Guidebook per person. In partnership with the Hilton York (directly opposite Fairfax House), we can offer your group the option of having a morning or afternoon refreshment package in the luxury of the hotel to precede or follow your tour. Options start from £3.00 per person for tea, coffee and biscuits. Experience a Georgian Christmas at Fairfax House with the annual ‘Keeping of Christmas’ display during November and December. Festive refreshments are also available to help your group fully savour the spirit of Christmas at Fairfax House. Please contact us for further information and to discuss your tailor-made visit and catering packages. We are help to help organise canapés or private dining for your group. Email us at info@fairfaxhouse.co.uk or call us on 01904 655 543.